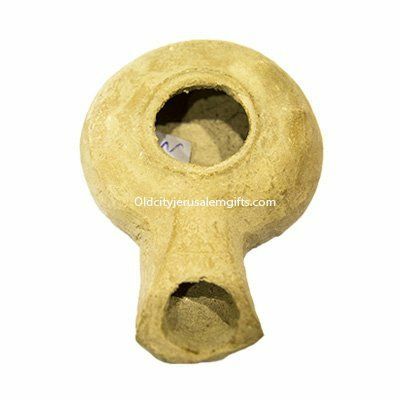 Classic Herodian period oil lamp used in the 1st century AD in central Judea. Typical oil lamp used in daily life in Jesus’ time! 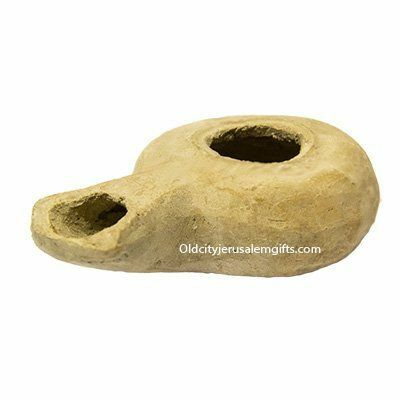 This type of oil lamp was manufactured in Jerusalem and was a common souvenir for first century Jews who traveled to Jerusalem to visit the temple. Date: 37 B.C. – 70 A.D. 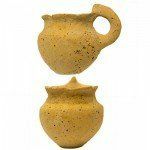 These Herodian oil lamps are very unique because this style was made only in Jerusalem, and was only in use for about a hundred years. This is the type of oil lamp that was used in the central hill country of Judea during the time of Jesus. The round body of these lamps was made on a wheel, while the distinctive nozzle was made as a separate piece, which was then attached, giving the lamp a unique look known as a “knife-parted” oil lamp. 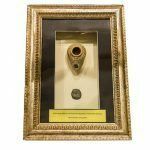 This type of lamp was made exclusively in Jerusalem, but has been discovered in excavations throughout the region because Jews who came to Jerusalem for pilgrimages during holidays would take these oil lamps as a souvenir from the holy city. These oil lamps come in various sizes and styles, sometimes with decorations and sometimes plain, making this a unique souvenir for travelers from the first century until today. 25 “Then the kingdom of heaven will be like this. Ten bridesmaids took their lamps and went to meet the bridegroom. 2 Five of them were foolish, and five were wise. 3 When the foolish took their lamps, they took no oil with them; 4 but the wise took flasks of oil with their lamps. 5 As the bridegroom was delayed, all of them became drowsy and slept. 6 But at midnight there was a shout, ‘Look! Here is the bridegroom! Come out to meet him.’ 7 Then all those bridesmaids got up and trimmed their lamps. 8 The foolish said to the wise, ‘Give us some of your oil, for our lamps are going out.’ 9 But the wise replied, ‘No! there will not be enough for you and for us; you had better go to the dealers and buy some for yourselves.’ 10 And while they went to buy it, the bridegroom came, and those who were ready went with him into the wedding banquet; and the door was shut. 11 Later the other bridesmaids came also, saying, ‘Lord, lord, open to us.’ 12 But he replied, ‘Truly I tell you, I do not know you.’ 13 Keep awake therefore, for you know neither the day nor the hour.